I just noticed that elixirs and potions have the same effects. Do they do the exact same thing? Do they have cosmetic differences? It says in the wiki that a shop can only be opened if the player has played for 1 IRL month or longer. I don't understand how any of these shops are turning a profit. I don't mean to pick on anyone or criticize,I'm just having a hard time figuring things out. It seems like they would buy the item from the "Official" Prize Shop and then sell it, but their shop prices are lower, so there's no buy-low-sell-high technique. (Not to mention that players can buy from both sources to get the better deal). Is it the case instead that player shops have an "infinite" OOC supply of items? Or, does a player only sell in their shop things that their character owns? I know some quests give items, but they don't seem like much, are there better ways of farming items to sell in one's shop? When a player purchases the item, where does their money go? To Xanth? Or to the player who owns the shop? Would it be possible to have a traveling shop? Say, a peddler? Or a traveling merchant? I'd imagine it would be like a flashing, only instead of seeing naked body-parts, one would see all kinds of wares (possibly some illegal?) that are purchasable? What kinds of things would be illegal? Is there a list of laws somewhere? For example, some countries outlaw Durians in public because of their immense foul odor from the "skin" of the fruit. This might tie in well to the conversations about guns that I have been hearing, and rumors of their introduction. Would Elysia have illegal narcotics? Which kinds of things might be illegal, and which not? What happened to the lottery and race events? I know there are only a few people, but activity usually brings in more activity. Okay, so the difference between elixirs and potions is mostly cosmetic, I guess: Elixirs are from Xanth and tend to be stored in ornate vials or bottles, while potions are mundane items. Potions could be kept in ornate containers if the shop owner wanted; Joy (Ionia's player) went with plain glass bottles, I think, because they're more practical and cheaper to source ICly (so, higher IC profit). I have vague plans to expand the Prize Shop so there's more variety in what's available, especially for elixirs and other items that can't be purchased in the bazaar (elixirs, for instance, are bought with karma so can only be acquired from Xanth), but I've included the basics for times when a usershop isn't active or is non-existent. The 1-month limit is really just to prevent people from opening a shop then disappearing before it's established. I could probably do away with the rule, actually, because we don't tend to get a lot of interest, really. Usershops aren't so much for turning a profit, necessarily, as they are opportunities for roleplaying that might not otherwise be available. Characters are assumed to do all the work that goes into their shop (sourcing materials, crafting items, manning the till, etc) "behind the scenes" for the most part, so there's no expenditure: every item they sell makes a 100% profit. Technically (OOCly, at least), they do have an infinite supply of such items — within the limits of what they can realistically craft/harvest/find/bake/whatever, and their skill. Obviously, an apprentice wildcrafter is going to have less on offer than a master wildcrafter who can find a better harvest or is more adept at utilising all the plant they pick rather than just pieces. Likewise, an apprentice blacksmith might only be able to make cheap, basic weapons while a master could custom-design stuff to suit. There isn't really much of a "market" in the sense you're speaking of. We don't have the numbers to sustain a true economy so you don't have to literally source/farm a bunch of leather to make a pair of boots. Money for purchases goes to either the character owning the shop (like in the case of Piper's Boutique where you'd pay Piper), to the shop's assistant if they're active while the owner isn't (as in the case of Dragon Scales Smithing where you'd pay Kiel rather than Zephyr), or to a Player Character if the shop's owner is a related NPC (like with The Riverside Apothecary where you'd pay Ionia even though the store technically belongs to Trent). A travelling shop would be fine! Travelling peddlars definitely exist (especially in Dardanos and rural areas), though you would have to consider things like transportation (unless Erasmos could carry a pack?) and the dangers he'd face (bandits, wild animals, etc). For an official usershop (as opposed to something like Jericho's usurer/store, where he doesn't actually get any income from his shop because I can't actually lend the money he does), you would need a thread in the Marketplace, which you'd use to maintain a list of prices or give an idea of what characters could buy from him. However, instead of having real estate to visit, threads related to his sales would just be tagged according to whichever area he was in at the time. 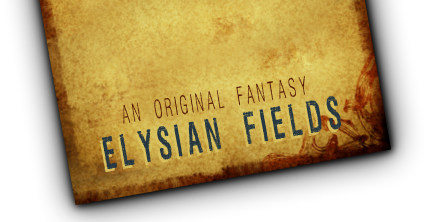 Franchises aren't really possible in Elysia, though. Or, I guess if the owner had a family large enough, they could spread out a bit, but think small cottage industry rather than department chains. Shop owners are usually people with a skill they can sell, such as blacksmiths or carpenters. Their stores tend to be family-run and -operated so there's someone to sell the products while the master is working, and they can only sell as much as they can make. Since something like a single sword could take several days to make, you can see how there'd be a limit on their stock. There's also a lot more competition between masters than there is co-operation. A "brand name" here tends to be much more significant because it's a quick way of suggesting the kind of quality and style you can expect. Something made by Zephyr Cairbre would be much different than something made by Kiel Taskel (because Zeph's a master blacksmith with years of experience under his belt and enough sales to his name to have become somewhat renowned as a man who produces quality goods, while Kiel is only a very-very-very beginner apprentice better known for talking than crafting ). Er, that's kind of a long-winded way of saying it, but very few masters, so far as I can see, would willingly loan their name to someone else — which is essentially what a franchise would be. They'd have to trust the other person explicitly to provide the same kind of quality and style as their own so they don't lose the reputation they've most likely spent decades — if not centuries — building. List of laws — no. Not yet, though the Crime & Punishment page does give a few general hints. The biggest thing to note is that things are much more personal here: A mugger is more likely to be tackled by his victim — and punished according to their own sense of justice — than they are to be arrested by an official guard. That said, we've discovered (through roleplay, mostly) that things like wolfsbane (dried arnica which traps Therians in their current form), stardust (a natural hallucinogenic), various deadly poisons, slavery, poaching and so on are all either illegal or restricted. There are bound to be other laws (I like your durian law) too, but mostly it's just a case of deciding as they crop up, I'm afraid. (You guys tend to think of things I never would!) Cities tend to be far more civilised, of course, so they'll have more rules there (mostly intended for keeping the peace). They'll also be much better equipped for actually enforcing those laws, so you'd be arrested if you were caught trading stardust in, say, Alexshire, while you'd probably be completely overlooked somewhere like Zinovia. I'm sorry if that's not very helpful. It's further complicated by the fact that the punishment for breaking such laws varies wildly from place to place, too. (Adultery is a death penalty in Zanarya, for instance, while Nymphs usually just turn a blind eye.) Generally speaking, EF is a combination of Medieval and Wild West justice, but with an issue like crime, it's usually okay to make it up as you go. I'll say something if I disagree so we can discuss it, but if it makes sense within the setting and to the related people, then I don't normally have a problem with it. I said above that things like wolfsbane and stardust are illegal, but the latter is generally only in cities/towns where having people drugged-up will cause problems. Wolfsbane is illegal because it ties into slavery, making Therians helpless so they can be captured and "trained", but how well the law is enforced really depends on the current government (some don't have a problem with "dogs" being caged while others are active advocates), magistrates responsible for judging such crimes, guards who might turn a blind eye, etc etc. For the most part, people are left to their own devices: if they want to drug their brains out, that's fine; just don't go crying to your guild (the only Elysian equivalent of welfare available, and then only asuming you've paid the annual fees long enough to have any money owing) later when you can't work because you've got a nasty twitch or you've gone blind from overuse. Sorry this is a bit wordy. I'm not very concise when I'm up past my bedtime , but I've hopefully given the answers you need! Lots and lots of ideas! Thanks, Emma! Yeah, I just like it because it's the kind of quirky law people probably wouldn't expect.